When Luis Suarez left Liverpool for Barcelona in the summer of 2014, there was a sense of inevitability about the transfer. The Uruguayan joined the Catalan club following a sensational last season at Anfield, albeit with a damaged reputation following another biting incident - this time on International duty for Uruguay against Italy at the World Cup, with his bite on Giorgi Chiellini resulting in a 4 month ban from football. Despite the baggage that came with Suarez, his phenomenal ability on a football pitch meant that he seemed destined to end up at Barcelona or Real Madrid - as the best South American footballers often do. He was quoted as saying that the transfer to Barca was his “dream move” not only for footballing reasons but also because that is where his Wife’s family lived. And as he embarked on the next chapter of his career in La Liga, it looked as though he would be leaving England with no intention of returning. But you can never say never in football, which is something that we found out when speaking to a very reliable and trusted Spanish reporter! Despite a fantastic record for Barcelona (boasting an impressive return of 155 goals in 209 games) as he assisted the club in a trophy haul that has included 3 La Liga titles and a Champions League among others, this season hasn’t started as well for Suarez as he would have liked. 3 goals in 11 appearances and struggling with a persistent knee issue have contributed to a difficult start to the season. 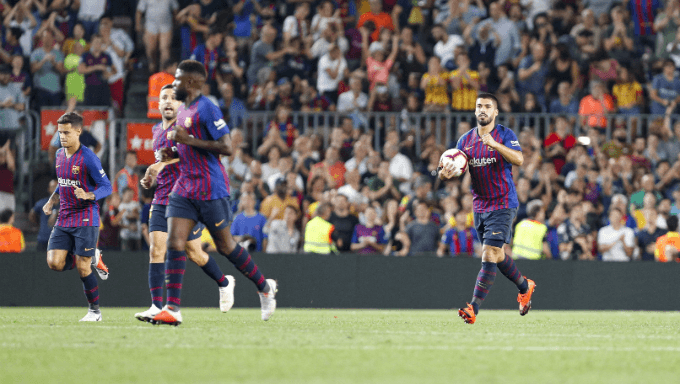 With his club currently sitting 2nd behind Sevilla after 8 matches in an uninspiring start to the season, we have been advised by our contact that there is a lot of unrest in the Barca camp. Summer signing Arturo Vidal has publicly expressed his frustration at a lack of playing time and hinted on social media about a problem with the Manager, Ernesto Valverde, and the Barcelona boss himself has recently expressed his own frustrations with his team who have now gone 4 league games without a win. Our Indykaila source in Catalonia recently made us aware that Valverde already has one eye on the future, looking to bring a younger, fresher look to the team and this was supported by the club’s summer business where unsurprisingly Vidal was the only player that was brought in over the age of 25. Valverde wants to create the next generation of Barcelona, predominantly made up of players who are good enough to win trophies now and worthy of playing alongside Lionel Messi, but can also go on to represent the club for the next decade together. Central to that are playmaker Philippe Coutinho and forwards Ousmane Dembele and summer signing Malcom, with further additions likely. The club have been linked with Paul Pogba of Manchester United in a deal that would surely cost a small fortune, plus 20 year old Corinthians attacking midfielder Pedrinho. With a rebuild such as this is likely to prove very costly, the club will look to move on some of their high earning more experienced players while they can still command decent fees. This is where Suarez comes in. Despite the success that he has enjoyed at the club and at 31 could still make an important contribution, the Spanish reporter that we have spoken to has informed us that Barcelona’s preference would be to move him on now and get his wages off their books, allowing them greater room to manoeuvre in the market. So much so that the club have already put the word out to a number of clubs and agents with a view to establishing how much interest there would be in the Uruguayan and possibly starting a bidding war for his services. The news has put a number of teams on red alert, with clubs in China and the MLS always on the lookout for big name players to help grow their respective brands. But it is the interest from the Premier League that will prove the most surprising! Having discussed this situation with a number of our sources throughout the country, we can exclusively reveal that a number of EPL clubs have expressed an interest in bringing him back to England and are ready to bid for him when the transfer window opens in January! The obvious link is a return to Liverpool, where the prospect of him linking up with Salah, Mane , Firmino and rekindling his partnership with Daniel Sturridge would have most Liverpool supporters in dreamland. However we believe that the Anfield club would be unwilling to spend big on him so if he were to rejoin then the fee would have to be reasonable, he would have to lower his wage demands to fit in with their pay structure and also be willing to accept a rotation role. Ambitious West Ham plus newly promoted Wolves and Fulham are all keen and happy to spend whatever is necessary to break into the top 8 in the Premier League. And the most controversial interest comes in the form of Chelsea, who feel that they need more firepower if they are to maintain a title challenge this season and beyond, and believe that they have the perfect manager to utilise Suarez’s abilities in Maurizio Sarri. Much will depend on the will of the player himself to move back to England having pushed so hard to leave in the first place, and if he could see himself playing for a Premier League club other than Liverpool … although his willingness to move to Arsenal in the past might just answer that one!